Has Social Media ruined the way our generation speak? Have you ever said LOL in real-life…? In recent years, words such as ‘selfie’ have entered the Oxford English dictionary as words like ‘tweet’ and ‘followers’ have had to be amended to cater for the alternate definitions that social media have given them. Although apparent for all social media users, the younger generation are the largest group that tend to disregard the English language and use their own ‘lingo’ to converse online. We now abbreviate and use acronyms more than we ever have before. The social networking site Twitter, encourages this with it’s minimal 140 character tweet limit. Many people feel this makes our lives easier as it reduces what we have to type, but others regard this simply as ‘dumbing down’ our language and makes us looks unintelligent. Check out ChatSlang for an excessive list of social media lingo ‘apparently’ used within the world today (I hadn’t heard of most of these). It gives you a bit of an idea into just how crazy this abbreviation malarkey really is. However it’s actually surprising just many articles have been published in favour of the new language in which we communicate in. With the ‘grammar police’ all around us, and those friends or relatives on Facebook who feel obliged to correct any errors that you have posted, it is actually making children much more aware of their wrongdoings to be able to help them in the future. For some people, seeing others around them on social media with their atrocious spelling and grammar encourages them to make sure they are not ‘one of them’ and make sure their use of the language is perfect. The growth of blogs, Twitter and Facebook considered in tandem with Tumblr and other social softwares that enable postings and tagging accounts creates an environment of continuous partial production. It’s not just the spelling and grammar element that’s a problem, but also the subject of what we’re actually posting – are we perhaps being too revealing about our lives? Many people – but not all – love to express almost all of their feelings at any given moment and document everything that’s happening in their lives, thus causing the abbreviation fanatics to cry out “TMI” (too much information). In the early days of Twitter this was very commonly seen, however it has now started to die down and this particular social networking site is now of much more value with almost every celebrity and well-established organisation having a presence. Because many people still regularly update their social media profiles, it means that face-to-face interaction can also suffer. This is because we already know their news – we’ve seen it online. Even more concerning is that when people do meet in person, they may still feel they have to be online and not surprisingly they’ll be cradling their smartphone lovingly. 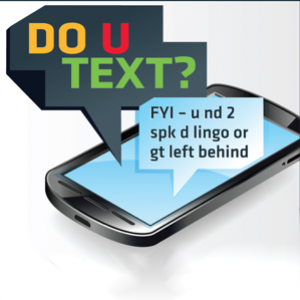 Just have a think about the language you use online – do u spk lyk ths or do you speak properly like this? I’d recommend reading the following blog for further knowledge of how in 2014, we are conversing between one another through social media. Changing the way we speak and write? Has it really wrecked our language? This entry was tagged Facebook, Grammar, Language, Social Media, Speaking, Spelling, Texting, Twitter, Youth. Bookmark the permalink.